Human beings are always learning, whether we are inside a classroom or outside of it. We may not always be conscious of the process. Our daily experiences of learning may range from figuring out an online booking system to a new mobile phone, learning a new sport to making a little child laugh. What is common to all of these, is that they involve a deliberate and direct approach to learning something that is useful, and connected deeply to the world that we live in. Classroom education has been moving away from the abstract, and rote based learning towards concepts connected to the real world. Teachers typically gave out information and students were expected to absorb it passively. Over time, we it has become evident that we cannot convince a student to learn something because it has been taught that way for many years and everyone before them learned it. Trio has incorporated experiential learning in the manner that it complements the offered curricula. When a child is shown how, say, learning to grow vegetables or calculating their monthly expenses can have an impact on their life, they will value what they are learning much more. The theory of experiential learning was proposed by David Kolbe, an American educational theorist. In his words, “Learning is the process whereby knowledge is created through the transformation of experience. Knowledge results from the combination of grasping experience and transforming it.” This form of learning is not always dependent on textbooks or formal instruction. The experience itself entails that the learner takes initiative to begin, direct and completely involve themselves in the learning process. The intention behind several school projects, workshops and trips are typically noble and are chosen to expose children to new things. However, an exercise like collecting different kinds of leaves or building a model of an aircraft does not automatically make it useful, if there is no self-reflection and assimilation involved. Take, for instance, an exercise to build a great camping tent. An educator can serve as an anchor and guide, by encouraging students to answer questions like, what is the purpose of doing this activity, what is your goal, what worked in the design, what did not work, what can we learn from other teams, what are the challenges and so on. Experiential learning effectively transforms the learner, by giving them a framework to approach any new situation with confidence and open-mindedness. Kolb’s model gives a 4 stage cycle, that the experiential learning process typically entails. Abstract Conceptualisation: Gathering information on how a system works and intellectual analysis of the situation. For example, learning to grow vegetables in the garden can involve, in this step, watching videos or reading up about different types of plants, weather, soil, tools etc. 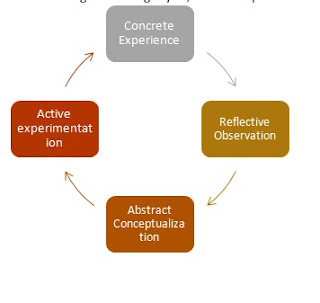 Concrete Experience: Encountering a new situation that catches the learner’s attention and learning from it. In our vegetable growing example, this may involve working with an expert gardener, learning to prepare the soil, seeds, watering, pruning branches and more. Active experimentation: Taking action towards accomplishing the set goal. In our example of growing vegetables, this may involve using the skills learned to setup a small garden and tending to it every day. Reflective Observation: Carefully observe the situation, and the available information. This is a critical step in the process where the learner deeply reflects on and synthesizes their learnings. One may reflect on what conditions kept the plants healthy and what conditions caused them to wilt. One of the challenges to implementing experiential learning, is the amount of preparation required on the part of educators. Adequate research must go into planning activities and just enough structure must be provided to students. One of the most significant changes we have made at Trio, is creation of a long term plan, with all our educators on board, to incorporate experiential learning activities throughout the academic session or adding a component of experiential learning into existing activities. Teachers are given sufficient support and resources to come up with activities that the children are curious about and find beneficial. The more interdisciplinary the nature of the activity, the better. Field trips or group activities are no longer concluded with a simple report, but with deeper self-reflection. When students are involved fully in the process of learning, and identify how their work impacts them on a personal and meaningful way, they are more likely to internalise those learnings and pursue an even deeper inquiry into a topic. They gain skills that they can apply to a variety of situations both inside and outside the classroom. They become motivated and autonomous learners who can tackle any challenge that life throws at them.